Before our class today, I had never heard of OpenStreetMap, map crowd sourcing or using different maps to collect data and help in disaster response. I am in no way a map enthusiast but the work that the Red Cross was able to do in Gulu, Uganda and in Tacloban City, Philippines following Typhoon Haiyan by using OSM is very remarkable. Upon further research into OpenStreetMap, I came across their sister company CloudMade. CloudMade uses maps from OSM to allow users to access map data, points of interest, navigation, routing and other data around their location even when not connected to the Internet. It all sounds well and good but I was still skeptical about the feasibility of this operation and even the necessity of OpenStreetMap when the map market already has technological heavyweights such as Google Maps, Nokia HERE, TomTom and to some extent companies like FourSquare and Yelp. But as this article suggests, monopolies on markets are not healthy for anyone involved. Furthermore, OpenStreetMap and founder Steve Coast’s other business endeavors have helped to revolutionize how we look at it and use maps. As of January 2014, OSM had over 1.5 million registered editors, with that number only growing because of the simple editing features that allow and encourage anyone with computer knowledge to contribute to the mapping platform. Obviously no mapping system is 100% accurate and even more so when the editing platform is open to the public. And with OSM and CloudMade offering international maps via Wi-Fi and in offline modes, this allows for people all over the globe to navigate without giving away personal location details, a big concern with users of Google Maps. This accessibility is certainly a major advantage that OSM possesses and explains why it has been such a helpful tool for the Red Cross in disaster relief. I am a big proponent of crowd sourcing and I believe that Wikipedia has shown that using volunteers and peer editing can be a viable tool for providing information. I can only hope that OpenStreetMap does the same with maps, not just for disaster response and international development but in all situations. The 2010 earthquake in Haiti was one of the worst natural disasters in recent memory. In the chaos and destruction after the earthquake hit, one radio station continued broadcasting and became a lifeline for Haitians. The station, called Signal FM, somehow withstood the earthquake and its tower was not damaged. Immediately after the earthquake, with electricity supplied by generators, the station started broadcasting important information about where to find help. One woman was even able to find her missing husband through a message she broadcasted on Signal FM. The station stayed on the air constantly for the two weeks after the earthquake. Originally they only had three days of fuel for their generators, but the Haitian government and several NGOs stepped up and provided funding to keep the station on the air. Signal FM organized a panel discussion on-air with journalists to keep people up to date on what was happening in the post-disaster chaos. According to this CNN report Signal FM reached about 3 million people in the Port-au-Prince area during the disaster and was also available to over the Internet. The fact that Signal FM combines traditional radio presence is combined with availability on the Internet is a great example of blending different types of ICTs in order to reach more people, as we saw in the case of the Farm Radio in Africa using SMS to tune people in to radio broadcasts. Bangladesh is very vulnerable to natural disasters like floods, river erosion, tidal surges, tropical cyclones, and earthquakes due to the vast network of rivers and channels, the geographic location of the country, and the monsoon climate. Over the past 30 years, frequent natural disasters in Bangladesh have taken the lives of thousands of people and cost the country millions of dollars in damage. About 200,000 people are displaced each year due to river erosion alone. In order to prevent more tragedy in the future, Bangladesh has put much effort into developing effective “early warning systems” for disaster management and prevention. i. Utilize remote sensing technologies for disaster management and mitigation. The Comprehensive Disaster Management Programme (CDMP) is leading the charge on these initiatives, in collaboration with the Government of Bangladesh and over 100 technical and academic institutions and NGOs at all levels. Their main goal is to strengthen the disaster management system in Bangladesh, but more importantly to focus more heavily on risk reduction (largely through technical assistance) via community risk assessments and mapping, earthquake and tsunami storm surge mapping etc. The National Disaster Management Information Centre (DMIC) has been a key instrument for the CDMP. 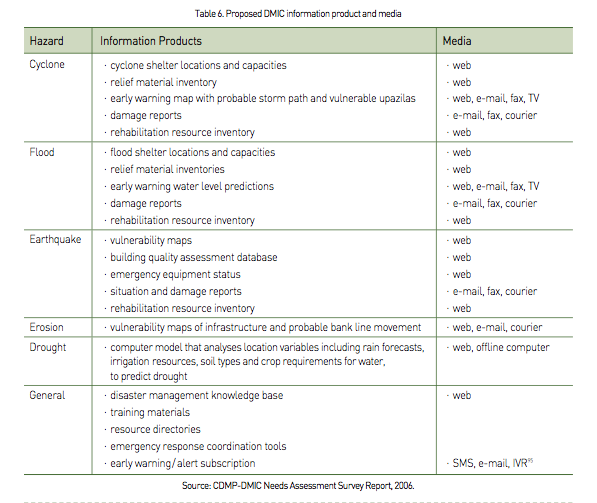 Together, they produced a very specific list of DMIC information products and media suited to support their disaster management objectives. (It was created based on the CDMP-DMIC needs assessment survey report, so it takes into consideration local ICT profiles, and penetration rates, and individual’s preferences). Today, “The DMIC generates time-sensitive information items such as early warnings, situation reports and other real-time data, and presents them in information products delivered through communication channels that cause the least delay, and are consistent with the capacity of users to receive and comprehend them.” (p. 67). One way in which they are acting today is through an alert subscription system which allows individuals to receive early warning messages via email, SMS, or fax. Messages are even tailored to the subscriber’s specific location and local hazard concerns. The work that Bangladesh is doing to re-vamp their disaster management and prevention program is impressive, and their commitment to using ICTs to achieve their goals is paying off. For more information on this case study (p. 52- 74) and others, click here. This past September, the HEROIC (Hazard, Emergency Response, and Online Informal Communication) Project Team, a research team hailing from the University of Colorado, and the University of California-Irvine, recently released a study in which they uncovered twitter trends that occur in the light of natural disasters. They completed their study based on the occurrence of the Waldo Canyon Fire that occurred in Colorado this past June. The fire impacted more than 32,000 residents of the Colorado Springs Area, and resulted in more than $352 million in insurance claims. From the start of the disaster, there were a recorded 100,000 related “tweets” from over 25,000 Twitter users. Following the study, the HEROIC discovered some valuable information regarding the trends of tweets during disasters: 1. Original content is most often produced by local-organizations and then re-tweeted by non-locals. 2. Inclusion of URLs shows that response organizations recognize the need to have additional information available outside of Twitter. 3. Highly active government organizations get the most followers following an event, and the largest of local organizations come in second. While these types of findings are not groundbreaking by any means, what I think they provide is appropriate tools for us to learn how to use twitter as more than a social media outlet, but more so as a tool and catalyst to disaster relief. The study can definitely help local and national organizations not only better their tweets, but also the timeliness of them and exactly what they should say in order to get their message across as effective as possible. With that being said, I hope they can redo these studies in light of more impactful natural disasters that had more national repercussions such as Hurricane Sandy, because I don’t feel like this specific study covers the whole breadth of twitter as much as I would have liked them to. Hurricane Sandy devastated the east coast this past week, and social media played a huge role in recovery and information about the storm. However, not all of what was shared on social media was helpful to hurricane relief. Some of the pictures and stories that were shared were false. Along with many false pictures, one with the Statue of Liberty being consumed by a tidal wave, there were many false reports being spread about the conditions of the city after the storm. One of these reports was that the stock exchange was flooded with three feet of water. This was shared widely, and many people believed that the storm was far worse than it was, causing fear for many people who had friends and relatives in the affected area. Although many people spread many different types of erroneous rumors, one culprit on Twitter was found to have been spreading the most prolific false reports about the hurricane. This person goes under the Twitter account name, #comfortablysmug. He made up the story about the stock exchange and made up several other stories about the metro systems and electricity in New York City. Recently, he was revealed to be hedgefund analyst, Shashank Tripathi. Tripathi’s false and shocking tweets were retweeted several hundred times. Although he has apologized for the false tweets, these tweets left a mark on the effects of social media on disaster relief. While social media can be very helpful, it can also hinder relief as false rumors can spread. It is important for people to remember to look for credible sources for their information following up a disaster. The application also has a Hurricane Sandy branch that is specific to the Northeast region. In this part of the application, users can track Sandy, find region-specific advice such as where to locate warming stations, and even address the emotional health issues that can come with being a victim of a natural disaster. The most interesting part of the application addresses communication during disaster. The “Safe and Well” feature was created by the American Red Cross prior to the release of the iPhone application, and was available on their website. People can enter their information into the program so that others that may be searching can locate other displaced peoples. This is a great tool for older generations that may not use tools such as Facebook and Twitter to update their information and communicate with others. Those that were hit by Hurricane Sandy reviewed and criticized the application, listing it as “indespensible” during the storm, but also listing areas of improvement. For example, some said that after the storm hit, information was not updated often enough. This is a crucial time for users to recieve constant updates while suffering the effects of the storm. Furthermore, there is the issue of the device requiring the GPS locator to be activated on the phone. This drains battery much faster than normal, and this could present an issue especially in a recovering region that may not have electricity to recharge the battery. I think that this application would have been very useful during Hurricane Katrina. Katrina hit prior to the surge of Facebook and Twitter, and therefore the significant amount of displaced peoples would have greatly benefitted from easy access to the Safe and Well feature. The application also offers a communication tool for those that are affected by the disaster. Users can write about their experience, offer bits of advice for others suffering from the same storm, and provide support. I think that with improvements made after critiques from Sandy users are addressed, applications such as this may play a vital role in future disaster relief. To learn more about the Red Cross iPhone app, click here.